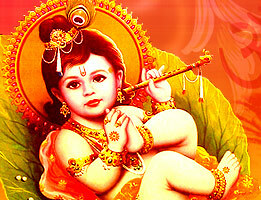 The festival of Janmashtami is celebrated with great zeal and fervor throughout India. 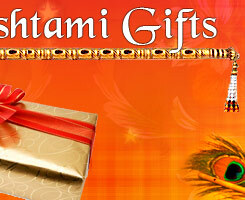 Janmashtami festival brings with it great joy and happiness in the lives of the devotees of Lord Krishna. The festival is celebrated to mark the occasion of the Lord's birth on earth. The festival falls on the eighth day of the Shravan month as per the auspicious dates of the traditional Hindu calendar. Lord Krishna is one of the most revered Hindu deities and has numerous followers throughout the world. To celebrate the Lord's birth, people stay awake till midnight of ashtami, as it is said it was at this hour that Krishna graced the world with his birth. To mark this occasion, devotees sing devotional songs and dance to the tune of bhajans with great enthusiasm and devotion. Go through the lines below to know the celebrations of Janmashtami. The festivities of Janmashtami can last for two to three days in different parts of India. During these days, special prayer sessions are organized in the temples. Devotees visit Krishna temples in large numbers to pay homage to the Lord. The celebrations and prayer ceremonies reach to their zenith at midnight of the first day when Shri Krishna was born. To symbolize this auspicious occasion, the idol of the infant Krishna, also known as Bal Gopal, is bathed with milk, butter and honey. The idol is later placed in a beautifully ornamented cradle. With the blowing of a conch shell, Krishna's avatar is announced to the world. To celebrate this pious occasion, many homemade dishes are prepared throughout India to present as an offering to Lord Krishna, like Murukku, Vella Seedai, Paal Payasam, Peda and Shrikhand. Devotees from all over the world visit Krishna temples placed at Vrindhavan, Mathura and Dwaraka for the celebrations of Janmashtami, as it is believed that Lord Krishna spent most of his life in these places. In some parts of Northern India, the festivities of Janmashtami are even more elaborate. Dance dramas based on various incidents of Lord Krishna's life are performed and enjoyed by the public. 'Dahi Handi' contests are organized in which groups of youngsters compete to reach and then break the pot of curd or butter hung on a rope quite high from the ground. Youngsters form human pyramids to reach this pot, silimar to what Lord Krishna did in his childhood. These thrilling contests are organized on every street and corner of Mumbai. Janmashtami is a wonderful occasion to remember the spiritual and righteous path shown to all mankind by Lord Krishna.